We agree: Lotte’s kimchi chocolates are strange. 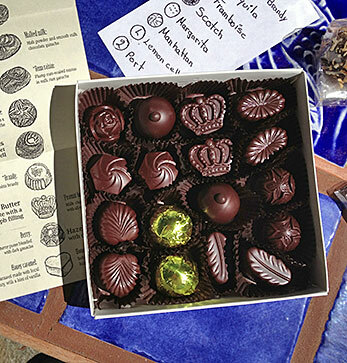 UPDATE 11/2014: Travel + Leisure has changed the selection of unusual chocolates featured in this article, and Kimchi chocolate no longer appears on the list. I think it lost out in weirdness to Pig’s Blood truffles or Peanuts & Ketchup chocolate bars. 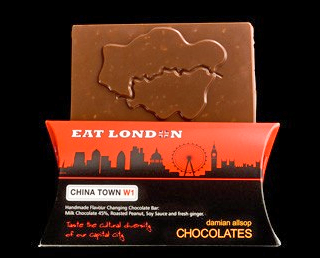 Travel + Leisure’s Feb. 2011 issue has an article on the World’s Strangest Chocolates. Korean Kimchi Chocolate makes the list! We’ve eaten Lotte’s kimchi chocolate ourselves and can attest to its strange flavor. Other chocolates featured in the article also sound like they deserve to be on such a list (Havana Tobacco, anyone? ), but most sound interesting and potentially delicious (Camel’s Milk Chocolates, described as “minerally and malted”, and French Toast, whose ingredients include molasses and bagel chips). Many of the chocolates mentioned include URLs, so you might be able to try one that strikes your fancy. As for me, I totally have a reason to plan a trip to Barcelona now: Oriol Balaguer’s Mascletà chocolates — hazelnut praline, sea salt, and Pop Rocks! Date posted: January 26, 2011. This entry was posted in American chocolate, Chocolate around the World, Korean chocolate, Outside the Bay Area, Update and tagged article, hazelnut, kimchi, Korea, molasses, peanuts, Pop Rocks, sea salt, tobacco, Travel +Leisure, truffles. Bookmark the permalink.